Credit union [кредитова спілка; kredytova spilka]. Voluntary, co-operative organization that provides its members with short-term loans out of the co-operative's accumulated savings. Individual credit co-operatives appeared in Ukraine in the second half of the 19th century: the first society of this kind was organized in 1869 in Hadiach; the second one was set up by Hryhorii Galagan in Sokyryntsi in 1871. At the end of the 19th century Raiffeisen credit co-operatives spread from Germany to Ukrainian territories under Russia and Austria. Generally, credit unions or savings and loan associations were the first co-operatives in Ukraine: by 1895 there were about 240 of them. Their development was encouraged by the zemstvos and by the Russian law of 1 June 1895 on the organization of small-scale credit. As the number of credit unions in Ukraine increased, local associations of credit unions arose: the first association was founded in Berdiansk in 1901. By 1914 there were about 2,500 savings and loan and credit societies in Russian-ruled Ukraine. Credit unions played a conspicuous role in improving and modernizing agriculture. After the February Revolution of 1917 the Russian Provisional Government adopted on 20 March 1917 a progressive law on co-operatives, including credit unions. An extensive network of credit unions developed, and by 1919 as many as 43 national associations were formed. To co-ordinate them a central co-operative association—the Ukrainbank (president Khrystofor Baranovsky)—was set up. While trying to control credit policy, the Soviet authorities tolerated a degree of autonomy and accepted the Ukrainian character of the credit unions. The Ukrainbank, its branches, and the local credit unions continued during the New Economic Policy period to provide the peasants with loans for purchasing farming equipment and livestock and for house building. In 1928 the Ukrainbank represented about 5,800 credit co-operatives. At the beginning of the 1930s the credit unions were dissolved, as the government sought control over credit operations; they were never restored in the USSR in the form of voluntary co-operative organizations. 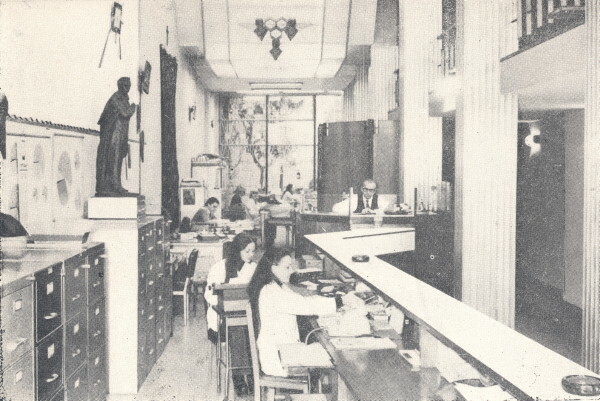 In Galicia the origins of the Ukrainian credit co-operative movement date back to 1894 when the Vira co-operative bank was established in Peremyshl. By 1898 the Provincial Credit Union (Tsentrobank) was founded in Lviv. In 1914 the Audit Union of Ukrainian Co-operatives represented 340 credit unions, which constituted 61 percent of the co-operative societies belonging to the union. Furthermore, about 400 smaller credit organizations of the Raiffeisen credit co-operative type were supported by the Galician provincial administration. In Bukovyna there were about 150 village banks by 1903; they were represented by the Selianska Kasa central bank union. In Transcarpathia the few credit organizations that existed in Ukrainian villages and towns did not have their own association. In the interwar period the Ukrainian credit-union movement grew rapidly in Western Ukraine under the Polish regime: there were 573 small village banks (mostly of the Raiffeisen type) and credit co-operatives and 115 branches of the Ukrainbank credit co-operatives and their central association the Tsentrobank. In Transcarpathia the Commercial Union of Agricultural Co-operatives represented 174 credit unions by the 1930s. In 1940 attempts were made to revive the credit-union movement in the Generalgouvernement and, by 1941, 61 credit unions were active, including 27 in the Lemko region and Sian region and 34 in the Kholm region and Podlachia region. The credit co-operative movement encountered serious difficulties in German-occupied Galicia: the German authorities severely restricted the activities of the Tsentrobank and the 71 branches of the Ukrainbank credit co-operatives. In 1943 there were only 114 credit unions in the whole Generalgouvernement. The Soviet occupation of Western Ukraine in 1939–40 and 1944–5 marked the end of the credit co-operative movement there. The first Ukrainian credit unions among immigrants outside Ukraine appeared in Canada at the end of the 1930s: the Nova Hromada Credit Union was organized in Saskatoon in 1939 and the Carpathia Co-operative Credit Union was established in Winnipeg in 1940. New credit unions arose in the 1950s; some developed out of earlier consumer co-operatives. Most of the Ukrainian credit unions are affiliated with community organizations or parishes. In 1956 there were 56 Ukrainian credit unions in Canada: 32 of them in the Prairie provinces (21 in Manitoba, 6 in Saskatchewan, and 5 in Alberta) and 24 in eastern Canada (21 in Ontario and 3 in Quebec). Their total membership was about 25,000. Two credit-union associations were formed in the 1950s: the Kooperatyvna Hromada association in Winnipeg (president: Vasyl Topolnytsky) and the Co-ordinating Committee of Ukrainian Credit Co-operatives in Toronto. In the United States the first Ukrainian credit unions were founded by the postwar immigrants in the 1950s. By 1961 there were 15 credit unions and by 1981 there were 34. The credit unions in the United States and Canada belong to a general central organization, the Credit Union National Association (CUNA), which has a common insurance company for group insurance on savings and loans. After the Second World War Ukrainian credit unions also developed in Australia and Argentina. Ukrainian co-operative credit unions, along with five or six producer, consumer, and publishing unions, belong to the World Council of Ukrainian Credit Unions (est 1973). By the end of 1981 there were 36 Ukrainian credit unions in Canada, 34 in the United States, 7 in Australia, and 5 in Argentina. Their total membership was 122,000 and total assets were 495 million dollars. According to membership and assets the largest credit unions are the Ukrainian Credit Union in Toronto; the Carpathia Co-operative Credit Union in Winnipeg; the Buduchnist Credit Union in Toronto; the Self-Reliance Co-operative credit unions in Chicago, New York, and Detroit; the Dnister Credit Union in Melbourne, Australia; the Karpaty Credit Union in Sydney, Australia; and the Vidrodzhennia and Fortuna credit unions in Argentina. The Ukrainian credit unions donate some of their profits to Ukrainian religious, charitable, and educational causes.